Michael Jamieson describes Glasgow's Commonwealth Games as the "biggest meet of my career" and is confident of landing gold in his home city. 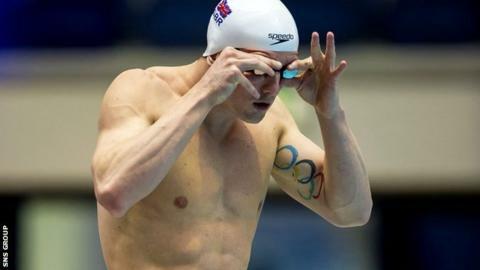 The 25-year-old Olympic silver medallist will be a strong favourite for the 200m breaststroke title. "It's a huge opportunity and I'm doing everything I can to get the result I'm looking for," he told BBC Sport. "I'm confident and I just need to make sure I stay focused and keep putting the work in over the next few months." Last week, Jamieson won the British 200m title in two minutes 7.79 seconds, the fastest time in the world this year. He was third in the 100m event, with fellow Scot Ross Murdoch winning. Murdoch, 20, also beat Jamieson over 100m in the Scottish Championships this month. Both of those championships were hosted in Tollcross, where the Glasgow Games swimming will take place. And, with 100 days to go before the Commonwealth Games open, Jamieson is using his good memories of success at the 2012 Olympics to spur him on for further glory in front of a home crowd. "Looking back on London, I remember really vividly getting onto the podium and having a look up to see all my friends and family," he recalled. "And my team-mates were there - the guys who hadn't quite been able to qualify for the Olympics. "It was important for me that they were there because they had a hand in my progress. I wanted them to feel part of the result. "It was an equal feeling of relief and happiness that I got the result I was looking for. "It was the realisation of a career-long goal. Winning that medal in London changed my life. I'm a sponsored athlete now. "In terms of my sporting career, it was the best few weeks of my life and I think Glasgow could be even better than that."